Day 56 – Rotated Unheroic with Suit Up! Back from the beach, and time to get down the business. 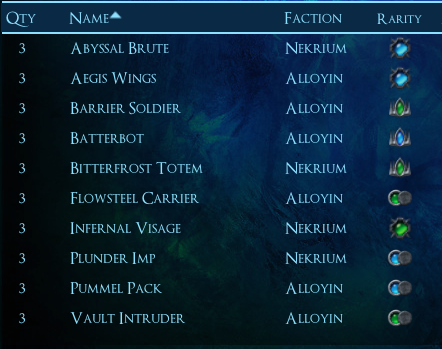 New additions here are Flowsteel Carrier, Vault Intruder, Plunder Imp, and Pummel Pack. Flowsteel Carrier was added to the deck to help support Batterbot and provide a pretty sturdy effect with armor + the regen from Visage/Abyssal Brute. However, with just Carriers and Batterbots, my robot count wasn’t all that great. So in comes Vault Intruder, which is a huge Robot with the added benefit of letting me see their hand – perfect for scouting whether or not to commit with a spell. For these two cards, I took out Spiritsteel Infiltrator (which didn’t activate enough and is randomly an Energeist instead of a Robot or a Spirit), and Scourge Hydra to fit in these cards. Scourge Hydra was fine, but something needed to come out, and Vault Intruder does a pretty good Scourge Hydra impersonation with the benefit of being able to be the beneficiary of Flowsteel. Plunder Imp came in as a concession to Darkforged decks. The darkforged generally have small power, especially the Tempys ones which I consider to be the main backbone of a Darkforged deck – Umbraskin Yeti and Darkstone Asir. I’m aware that in the Esperian Darkforged deck, I have no on-level targets for Plunder Imp, but Esperian is completely unable to deal with Armor outside of Dendrify (unlike Nekrium’s /-X effects or Tempys’s Shatterbolt), so that’s a concession I’m willing to make. Calamity Fiend came out for these guys, thankfully. I’m not a huge fan of Calamity Fiend due to Assault, and really value the information Imp gives me over the shrink + body of the Fiend. Pummel Pack joins Aegis Wings and Infernal Visage as a really, really good pump spell for Batterbot, and a decent one for everyone else. I took out Palladium Wave for this card – a pretty easy exchange, considering Palladium Wave does not actually reduce the effectiveness of Darkforged decks by any huge margin. So I ended up not doing that well this week, mostly due to my inability to handle droves of Darkforged. 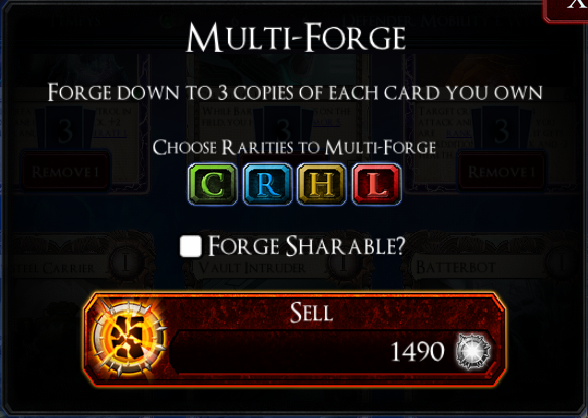 Unfortunately Darkforged are very momentum based and not very forgiving, so the whole format may just be only Darkforged decks now. Ah well, at least after a few more drafts I’ll be able to play in another Unheroic tournament – with Darkforged this time. Unfortunately, no random code for me.